This collection brings together three novellas by USA Today bestselling author, M. Louisa Locke: Violet Vanquishes a Villain, Kathleen Catches a Killer, and Dandy Delivers. These shorter works contain the light romance, humor, and suspense of the novels in her cozy Victorian San Francisco mystery series and are an excellent introduction to the gas-lit world of late 19th-century San Francisco. Violet Vanquishes a Villain: In this novella set in August of 1880, Annie and Nate Dawson’s trip down the San Francisco peninsula to San Jose was supposed to be a pleasant romantic interlude and a chance for Annie to get to know Nate’s family better. When the visit takes a serious turn, Annie races to expose a criminal who could ruin a young man’s life, getting help from an unexpected quarter. 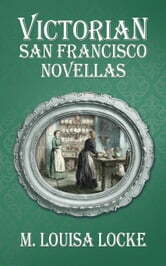 The events in Violet Vanquishes a Villain come right after Deadly Proof, the fourth book in Locke’s Victorian San Francisco mystery series. Kathleen Catches a Killer: As 1880 comes to a close, the O'Farrell Street boardinghouse servant, Kathleen Hennessey, expects to spend a quiet week while her employers, amateur sleuths Annie and Nate Dawson, are off spending the Christmas holidays with Nate's family. However, when she agrees to help out one of her friends, Kathleen discovers that a simple case of a servant being dismissed without notice has turned into a complicated and dangerous puzzle that she is determined to solve. The events in Kathleen Catches a Killer come right between those in Pilfered Promises and the third novella in this collection, Dandy Delivers. Dandy Delivers: It’s January, 1881, and while the grown-ups in Annie and Nate Dawson’s San Francisco O’Farrell Street boardinghouse are busy with their own affairs, two boys and a dog find their own adventure. Ian Hennessey, a poor boy from South of Market, who is trying to shoulder a man’s responsibilities, gets in trouble, and his best friend, Jamie Hewitt, does what he can to help. But it is Jamie’s young Boston Terrier, Dandy, who saves the day.